Full service interior design services for an entire home or project, from start to finish. It's a comprehensive approach that allows us to bring together a beautiful, thoughtful design in a manner that's seamless, stress-free and completely pulled together. Our mission is to serve our clients with creativity, integrity, and common sense(!) 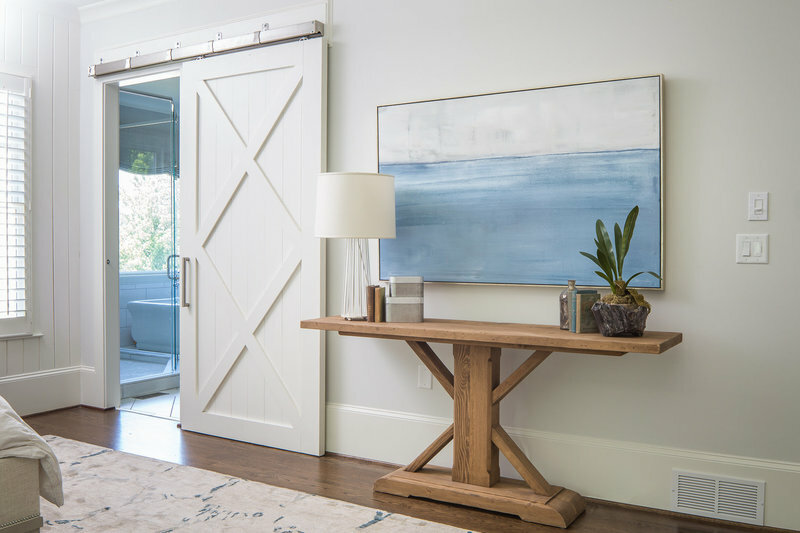 in the design process, resulting in a custom, curated environment you'll love to call home. All full service projects start with a consultation. Every project starts here. Big or small, full service or retainer. It's a working meeting—up to two hours—where we'll get together, walk through your ideas, answer your questions and get right to discussing what's possible. We'll discuss how it can work, creative options, and how to bring it all together. At the end of the meeting you'll receive detailed notes with everything we discussed (yes, detailed answers to design questions, vendor info, next steps, etc), or we'll take the notes with us and move on to preparing your Project Estimate for your full service design. It's a no-bull, straightforward approach to getting some answers and getting things done. Let's go! The custom build process is filled with a million little decisions. Bringing our 10+ years of new construction experience to the table, we not only select the finishes and fixtures that reflect your tastes and style, but let you know when to splurge and where to save. We're there to meet with your architect and build team—throughout the entire process—to help navigate the new build process and help you create the home of your dreams. Are you a builder? We also assist builders making selections and would love to help maximize your investment. Contact us today for more info. Think of this as your personal "designer on call". Clients have used this option for small, quick turnaround projects (think living room refresh, guest room update...) or as a way to get help with the big, and little, decisions, in a less structured way. It all starts with a consultation, as this helps us gather information on style, scope, and develop a plan of action. From there, we'll map out a game plan that meets your design objectives and helps create the results you want. So now the only question is: how can we help? Ready to get started but not sure where to start? Click the link for a complimentary 15-minute discovery call. We can chat a bit about your project, discuss a few details and see if we're a good fit. Contact us for more info, schedule a consult, or just say hello. My wife and I wanted to build out an unfinished basement. We thought we could "do this ourselves". Under the impression you could just hire a contractor, come back in a few months -like a "do it yourself" TV show - and all would be perfectly revealed, we set out on the project without a decorator. Boy were we wrong! We stopped construction for months, then spoke to a friend of ours who had worked with Tara in the past on their home and recommended we connect. Not only did Tara get our contractor back in-line, she did a complete redesign and the result was even better than we originally imagined! Trust in Tara's vision, and she will be a fantastic designer for anyone wanting a beautiful space that won't look like everyone else's on the block. We recommend her without hesitation! "the result was even better than imagined." Tara possesses a true gift for interior design. I worked with Tara to totally renovate our kitchen, family and dining rooms. She was wonderful to work with from the initial consultation through to the completion of the projects. She is a true professional. The designs she created for our home are truly inspired and creative. We are delighted with the results of Tara's design expertise; our kitchen, family and dining rooms are beautiful, fresh and current. We highly recommend Tara. "we are delighted with the results." Tara was wonderful from the get-go for us. We were dealing with the loss of our home due to a fire and she walked with us through each step in rebuild. She "got" us and our aesthetic of what we wanted to start new memories. Many times, I turned the reigns over to her directly for decisions, which was effortless. Tara was great in keeping within what we anticipated for insurance budgets, and knowing what few things are worth splurging, and what wasn't. Our new home is beautiful and we couldn't be more appreciative of all her work and talent. "our new home is beautiful."